With the mild winter and spring we have had, it might seem strange to think about ways to keep yourself warm, but there’s no better time than the present to prepare for chilly weather down the line. In his blog [Berto] was thinking about how to keep warm when things cool off again, and decided that a heated poncho would be great to have on hand. He found a dead simple way to craft his heated poncho, requiring little more than a bit of wiring, some thread and cloth, as well as a pair of scissors. [Berto] picked up a 12V-powered electric blanked, then proceeded to cut a head-sized slit in the middle of it, avoiding the heating coils. He sewed a bit of cloth around the hole to ensure it didn’t end up ripping over time, then he wired the blanket up to a 12V battery he tucked away in his backpack. The result is a variable-temp poncho that you can use to keep warm in a variety of situations. [Alan Parekh] from Hacked Gadgets says that he thinks the poncho would be awesome on a full-day snowmobiling trip, and we think he’s right! 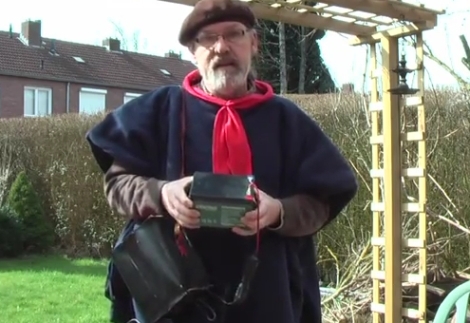 Continue reading to see a short video where [Berto] explains how to put one of these heated ponchos together. It’s nice how simple this hack is, but good luck getting on an airplane with that thing. 1: “hey nice bathtub… but good luck getting on an airplane with it!”. a 10Ah 12V SLA battery? That’s some 3.5kg you’re lugging around there. How about grab 10Ah of 3S LiPo batteries at 800g? Or for the safety conscious, even 10Ah of LiFePO4 would only weight about 1.2kg tops. If you’ve gone to school you would realize that 30+lbs in your backpack is nothing. There is no way that battery comes close to that? A 10ah lithium battery (with protective circuitry, even if you made it yourself) would cost at least 2-4 times as much. Um a properly designed poncho already does that. How about learning how to sew? Interesting hack, especially modifying the blanket turning it into a poncho. From a “keeping warm” standpoint its probably not as efficient than something that’s more snug on the body. If you visit a hunting supply, or motorcycle clothing store, you will find electric socks, gloves, vests, jackets, etc, etc. Generally they focus on the hands and feet because that’s where you loose a lot of heat and the body has to work more to keep it warm. I think they focus on those areas, because they’re the first ones to lose blood circulation when the body starts to conserve heat. Aka. why you drink a swig of whisky to keep your fingers from freezing. Just to clear things up, alcohol doesn’t warm you up. You feel warm because the alcohol sends the blood to the surface of your skin where all the heat sensing nerves are. At the same time it allows the cold to enter your body. So pretty much you freez yourself without knowing it. Yes, but that’s the point of it. Your body doesn’t know that it’s going to get back to warmth in a matter of hours, so it starts to shut down the blood circulation to your fingers and earlobes etc. the moment you get slightly cold, even though you’re not in any danger of hypothermia. Instead of going “Hmm.. it’s cold, let’s put out some more heat”, it goes “Oh my, it’s cold, time to drop off the fingers to conserve energy”. That is the real reason why the St. Bernards dogs carry a bottle of brandy. Alcohol is a good first aid for onsetting frostbite. The St. Bernard’s dogs carrying brandy is supposedly an urban myth, but one that is so prolific that some now carry the little barrel of brandy purely for tourism reasons. Cool Daddyo, like totally gone! (Google beatnik) Two thoughts, could be useful with a modified E-Bike (keep you warm when riding) and what happens when it rains? Years ago, I saw a documentary about an electic heated vest. The idea was that the vest put so much heat in your chest that your body becomes overheated and tries to vent the exess heat. This made it possible to do very delicate work in the freezing cold without gloves on because your body keeps pumping warm blood into your hands to get rid of the heat. In “Batman Begins” Raz Algul (spelling?) tells Bruce to warm his chest, as his arms will take care of themselves. BUUUT, as was mentioned, connected to a snowmobile and having the extra battery also connected (seperately) and charging would be immensley useful! PS: wow, so you really can buy one of those already? They make heated vests, very common in more northern climes for motorcycling. However, I think this idea is bit overkill and I think using a poncho with greater insulation to be a better solution. Then, just open up vents as needed. maybe make it reversible with a reflective layer that is worn on the inside when it is cold and reversed during the summer. Actually, just about anything other than a poncho would be better (like a vest) as there is a lot of wasted real-estate in a poncho. Works well, when you have a good power source. I made a vest with ~30 feet of 30 awg (IIRC) stranded, teflon coated wire. Works out to about 70 watts peak, on 13-14 volts of my motorcycle’s charging system. Its a BMW K75, with a 700 watt alternator, so it has power to spare. Problem with having it mobile, is that the storage of batteries is just not enough. 12 amp-hours, is gone really quick. 60 watts=5 amps@12 volts. A tad above 2 hours for full discharge. Then you are cold. You are better off with lighter fluid or solid fuel pocket warmers. A pound of lighter fluid will keep you warm for days. Lol, MILD winter ? I’m from Romania (Eastern Europe) and it’s the first time we had temperatures under -25 Celsius in the capital city, which is in the south, by the way… I had to take my car battery with me everywhere I went, if I left it in the car it died in a couple of hours… haha. Sorry, I meant the first time we had under -25 in over 50 years. If you could just correct that in the original post and delete this reply ? Thanks ! Won’t the blanket be dumping half the heat in to the air? Aren’t ponchos designed to keep one warm as well as dry? So what happens when it rains? Depends on if it’s Mexican or Sears. An average fill down coat that weighs as much as this would have over two cubic meters of insulation. The 1940’s called, they want their poncho back. This just in! Area man uses device meant for keeping warm, for keeping warm in a less productive way! I recall seeing something like this in modern mechanics, popular mechanics, or one of the other science mag clones from maybe 0930 or so. They had a clever workaround for the battery; the idea was that it was a heated cloak for policemen on foot patrol in winter, and every so often along the route they had a platform with two copper contacts, connected to current. The officer could stand on the contacts, and had metal plates in his shoes connected to the wiring in the cloak, so he could rewarm himself before walking to the next platform. That should be 1930. No electricity in the tenth century. Ummmm yea. There are many materials that will do a far better job then this. One of these being Primaloft or Down (Primaloft having the advantage of staying warm even when wet). If I’m going the electric route I’d rather buy something from Cabelas, or one Columbia Sportswear electrified jackets, gloves, and boots. Beyond those options though, if you want to be cheap, go to the nearest thrift store or military surplus store and buy several wool items, such a peacoat, sweater, gloves, wool nightcap, and then get yourself some wool long underwear. You will be warmer then this guy for much less hassle and cost. Try for a Pea Coat made prior to 1980. Later US Navy peacoat patterns use lower quality wool + Polyester filling. Earlier coats use 100% wool in a tight weave. If it’s really cold, try Puttees – they are strips of wool that wrap around your boot and leg. They keep your legs warm, keep the water and snow out of your boots, and are more comfortable than gaiters. You can find them at a lot of Military surplus shops.